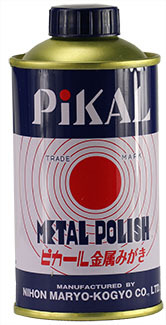 PIKAL metal polishing paste is a superior polishing paste with excellent cleaning and polishing qualities. It has been formulated as a thick paste, containing finely graded abrasives and a carrier/extender based on mineral oils. PIKAL polishing paste does not contain silicone. With its high concentration of solids, it is most effective on harder materials and can be used on stainless steel, steel, alloys, titanium, chromium, nickel, copper, alumium, enamels, ceramics, but not on plastics. Very effective in removing hard stains and restoring full luster to polished metal surfaces. PIKAL professional polishing paste has found many applications in cleaning and polishing. It is a tried and tested products with a great track record for over 100 years. Due to its consistency PIKAL is easy to use on swabs, wipes and buffing wheels. For standard vacuum and UHV applications we recommend to clean the polished surface with a mixture or 50/50 acetone/isopropanol. Supplied in a long lasting 250 gram tin. PIKAL Care metal polishing paste has been formulated as a thinner paste. It is especially effective for stainless steel surfaces and other metals and ceramics. It is supplied in a tube to enable direct application on surfaces. It has a more gentle action than the thicker polishing paste. It is recommended to use soft textile wipes for polishing. Wenol metal polish has been favored by many microscopists for cleaning and polishing parts for electron microscopes and used to be a mainstay in EM labs. Now available again for the best cleaning results for SEM, TEM, FIB and vacuum coating systems. Ideal for cleaning Wehnelt cylinders, anodes, aperture holders, sample holders, vacuum coating shielding parts and internal vacuum chamber parts. Wenol is petroleum based with fine graded aluminium oxide particles as polishing compound. The carrier fluid assists in removing hydrocarbons and is easily removed. It does not contain silicone. The consistency is paste like, which makes it easy to use on swabs, applicator sticks, cotton balls or polishing cloths. Other applications include cleaning of tarnished metal surfaces, final polish for fine mechanical parts and polishing vacuum feedthrough rods. Originally developed for polishing metals such as stainless steel, it works just as good on copper, brass, bronze, chrome or nickel plated metals etc. Can be used on soft metals such as aluminium when proper care is exercised. 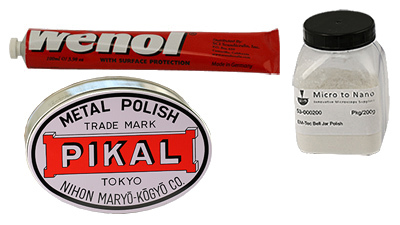 Wenol is similar to metal polishing compounds such as POL or Unipol which came later to the market as replacements. For final cleaning we recommend a rinse in isopropanol/acetone mixture. Available in a 100mml tube. The EM-Tec Bell Jar Polish is a soft dry polishing compound. It is specially developed as non-scratching polish for glass and similar surfaces. Ideal for using on glass bell jars and windows used on vacuum systems such as sputter coaters, carbon coaters and metal evaporation systems. 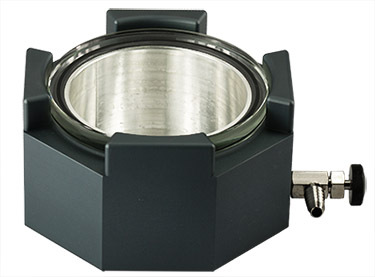 Compatible with glass vacuum chambers made from Schott, Corning or Pyrex glass. EM-Tec Bell Jar Polish main polishing ingredient is select grade calcium carbonate and does not contain dyes, chlorine or phosphor. It is best used with water and a polishing cloths or textile wipes for optimum results. Equally suitable for cleaning metal surfaces such as stainless steel and other hard metals. When used on soft metals, like aluminium, micro scratching can occur. After polishing, clean residue with moist wipes and a final rinse with isopropanol/acetone. Available in 200 gram container.